I guess I felt I wasn't far enough behind...I got 3 more Hitchcock movies. They were on sale more at Amazon. The young daughter of a police chief protects an escaped murder suspect in this "crisply paced, excellently performed" (The New York Times) thriller. Restored and Remastered! Includes Audio Commentary, Audio Interviews with Peter Bogdanovich and Francois Truffaut and More! This is another entertaining movie overall. The set up and plot are interesting, though there are a few scenes that move a bit slower. There is a good amount of suspense in several scenes. There are a few impressive shots, like the long tracking shot - I think that is the right term - late in the movie that goes through a large set until it stops on something important. The characters are interesting for the most part. The woman playing Erica had played the daughter in The Man Who Knew Too Much. I read that in the book thing that is with the set this movie is part of that I have. There weren't many extras for the movie. This one does start off slower while the various characters are introduced. I was wondering briefly where the train was..lol. Anyway, the movie has a unique group of characters and there are some humorous moments with some of them. There is a good amount of tension and suspense throughout the movie, especially once the woman has vanished and everyone denies ever having seen her. The mystery is decent and helps to make things interesting. The explanations for what happened as well as why everyone denied seeing the woman ultimately work. Many of the passengers have their own somewhat selfish reasons for denying seeing the woman. There is decent chemistry between the main characters and their developing relationship is believable. Overall, the movie is very entertaining and I enjoyed it. You forgot to mention the title in the last one. I assume it is "The Lady Vanishes"
I have decided to remove my name from the movies "Spellbound" and "The Paradine Case". As you know, I had bought one of those public domain sets of some of the early Hitchcock movies. Yesterday I found out, that contrary to the first two discs, the last disc which contains those two movies does not have any original English soundtrack. Only the German dub. Combined with the general poor transfer of the release, this is just enough reason for completely avoiding watching this disc. Sorry. perfectly understandable. I'm not sure what the quality of my Spellbound will be like as it's a Prism label and they're a budget release. That's understandable. Some of the ones I've watched on the one set have had fine video and audio quality while others aren't that great. The video was good for The Lady Vanishes...audio for the most part. The chief doctor (Leo G. Carroll) of Green Manors Mental Asylum has been forced to step down. His replacement, the young Dr. Edwardes (Gregory Peck) is not all what he seems. Dr. Constance Peterson (Ingrid Bergman) cannot help but fall in love with him, despite realising he is not the real Dr. Edwardes, but an amnesiac imposter who may be guilty of murder. Spellbound? No, not really. One of the best premises of a Hitchcock film so far is ruined by a melodramatic, laborious and unfocused plot, full of psychobabble and not enough psycho. As always, the romance is the real story, but as so with Secret Agent, it suffocates the rest. None of the cast standout, except for Michael Chekov as Alex, and Ingrid Bergman is a favourite actress of mine, yet here she’s saddled with a boring character in an oddly anti-women story; several times the dialogue makes a point of saying how women are basically useless once they’re in a relationship. Turning into a road trip, like 39 Steps again, was surely unnecessary. Paranoia within a mental asylum should be perfect for suspense (see Vincent Price in Shock), but they run about the countryside instead. Lacking the touches of humour you can normally rely on, it’s mind-numbingly predictable, and lazy, judging by a horrible montage sequence leap-frogging months. It plods along to the inevitable conclusion, but the last act does pick-up when you know who is behind it all. Hitchcock does like the viewer to be complicit usually, so maybe that’s why it felt smoother. Visually Hitchcock does little to give the film an identity, except for a final shot within Green Manors which was complicated, audacious and quite brilliant, especially for its time. It’s a plot point that has become a cliché, but I don’t think I’ve ever seen it done like that! That, and the incredible Salvador Dali dream sequence lift the film above average. Sadly for every decent moment there’s a dodgy one as well. Hitch always liked back-projection which tends to date his films in some cases and this contains the worst I’ve ever seen! Selznick was producer and I don’t know how involved he was, but this reeks of Oscar-baiting as it brushes the nastier aspects of the story to one side to concentrate on the love story. The score is torture until the last act. It plays the same bloomin’ melody over and over again! Similar to the same theme used across many Fox noir pictures. It’s definitely a case of ticking boxes to make an identikit film that will appeal to awards. Rebecca could also be so accused, but at least that had a story that relished this sort of thing. 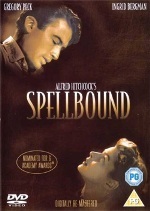 Spellbound should have been a straightforward shocker and I can only assume Hitchcock was not the driving force and was perhaps letting Selznick ease him back in after his return to America. 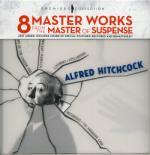 By the way, the DVD is a clumsy release, but there's some great material on Hitchcock. So, I can recommend this: Dali, last shot, extras. Job done. Have you been sat there, waiting for me to post? Nice prompt, I need to catch up with Hitchie and 007 next. I did consider either Rebecca or Goldeneye last night, but I wasn't in the mood for either at that time.